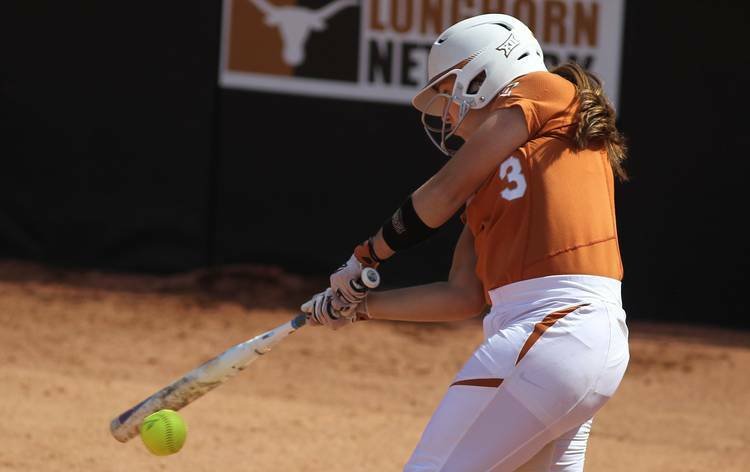 The Texas softball team won their first Big 12 series of the season with a 5-2 victory over Kansas on Saturday at McCombs Field. Seven Longhorns had hits and Paige von Sprecken (6-5) picked up her sixth win in the circle. MK Tedder, Bekah Alcozer, Malory Schattle and Kaitlyn Slack each had RBIs for Texas. Janae Jefferson scored two runs for the Longhorns. Von Sprecken allowed two runs on two hits in four innings. She struck out four and walked two. Erica Wright earned the save as she allowed one hit in three innings. Texas got on the scoreboard in the first inning thanks to a wild pitch and a sacrifice fly by Alcozer. After Kansas tied it in the top of the second, an RBI single by Tedder in the bottom of the inning put Texas in the lead for good. The Longhorns added two insurance runs in the fifth inning. Tuesday DerMargosian was the pinch runner at third base when Schattle bunted up the third-base line. DerMargosian scored on the squeeze play to make it 4-2. After that, Slack came up to hit an RBI single to cap the scoring. The Texas softball team will go for the sweep in the series finale at 11 a.m. at McCombs Field on Sunday.